Stump The Teacher: Does Twitter Matter? Many people question the value of twitter and if it can really make an impact for an educator. After nearly two years as a user, I can say with little hesitation that twitter has impacted my life in ways both subtle and profound. Clearly anything that a teacher spends a significant amount of time engaging in and claiming it is “PD” should benefit the students, right? Well that is certainly true in my case. Due to connections I have made on twitter, my students have be able to make connections as well. They have engaged in the Collaboreyes Project as well as Skyped with classes in different parts of the country. That is not to say I could not do this without twitter, but twitter certainly made those connections easier to create and foster. In addition, there have been countless times I have reached out to my PLN to help my students. I was able to have my students connect to experts while doing research as well as gain primary sources. Another huge benefit has been the innumerable resources I have been able to give my students through the sharing I have done on twitter. There has been numerous ways in which twitter has helped my teaching. Probably the simplest way is through the conversations I have been able to participate in. Some of the easiest to get involved in are the various chats that take place weekly and use a hashtag to follow. It was through these chats that I learned about the Hole in the Wall Theory that framed a research project and guided much of my teaching. I gained numerous resources for teaching Social Science with the help of the great folks at #SSCHAT. I have also been challenged about my beliefs on homework, grades and overall teaching beliefs on a regular basis that has helped shape what I think of as my own teacher identity. Another specific thing I pulled from twitter was connecting with Daniel Pink and chatting with him about his work and book, Drive. His work and conversations sparked Innovation Day at our school that has gotten national attention. In addition, I was actually able to sit in Pink’s house and talk with him about education, business and how the two can intersect. The impact on my life goes far beyond just making me a better teacher and yet related. I firmly believe that the work I did this past year as a teacher was driven in large part to the learning I was doing on twitter. It is because of this renewed approach to teaching and the connections I made that lead to some of the recognition I received for my teaching this past year. 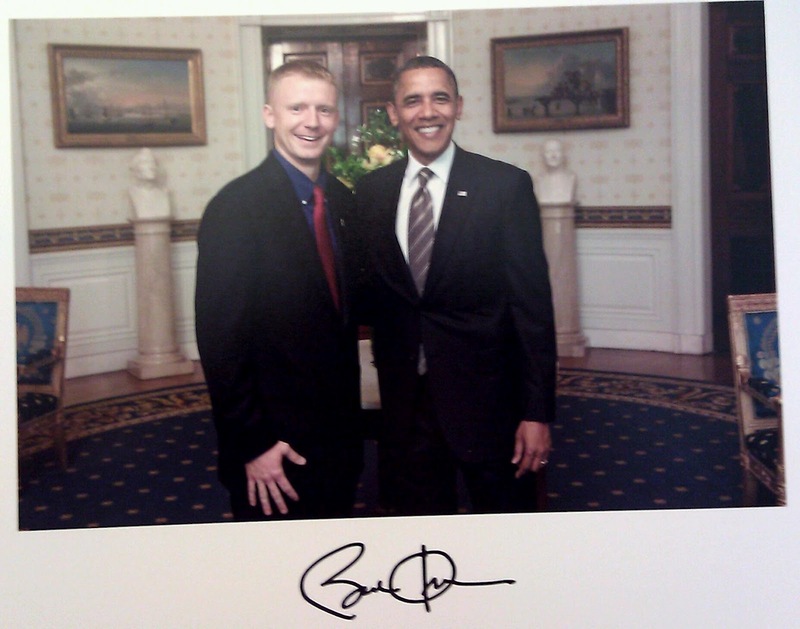 As a result of these recognitions I have been able to meet the President, fulfill a lifelong dream and do things and meet people I never thought were possible. Some people might think twitter is trivial, but I can honestly say it has changed my life. The impact on my family is both negative and positive as one can imagine. I have had to work to provide balance in my twitter use so as not to neglect my roles as a parent and husband. This might seem silly, but it is something that must be put into perspective. However, the impact of my twitter “folks” was illustrated perfectly last month when I attended ISTE in San Diego. Prior to attending the conference my wife had hip surgery to repair damaged cartilage and some bone irregularities. Now the surgery was not that invasive but she was laid up and out of commission. Right before I was preparing to leave for ISTE the doctors found a blood clot in my wife’s leg during a follow up which was incredibly scary for both of us. I tweeted out something about it and within minutes I was flooded with well wishes and prayer notes. Now, this is to be expected as most people are human and this is something we do. Yet, what I didn’t expect was the number of people that sought me out in person in San Diego to see how my wife was doing out of genuine concern. Even today, several weeks later, I am still having folks tweet me to ask how my wife is doing. This is not the part of twitter that most people are seeking when they “join up” but it is a real aspect as personal connections are powerful and meaningful. If you know someone that is not on twitter…harass them a little bit more to jump in the water. I am not going to say twitter is for everyone, but it is certainly for me as I get way more out of it that I originally bargained for. Up until a few months ago, I was one of those people who didn't want to give twitter a shot. Then I started researching flipped classroom and met Cheryl Morris, who suggested I follow her on twitter and introduced me to lots of educators. From that moment on, I definitely saw what I had been missing. I have gotten so many ideas that will impact my students and teaching, that I don't know how I ever lived without it. Great post! I hear ya about the family/Twitter balance as I can easily spend way too much time on Twitter with all the great conversations and people to connect with. Have a great rest of summer and I hope your wife is doing better. As per my perspectives twitter really helps people to get the daily activities of celebrities. It is useful for students is well. You have summarized the power of Twitter very well. The networking, resource availability, etc is ridiculously amazing! I just wrote a post myself last week entitled "Twitter: An Educator's Dream PLN". Too bad it is already dated as amazing journey continues. You hit the nail on the head! These are the very arguments I use to try to convince teachers that twitter is not evil, and that twitter is not irrelevant. Students (mine are older) also need to see that twitter holds more relevance than the banal rants they use it for! Thanks for making the power of twitter and the value of a PLN so clear. Twitter is something I'm struggling to make more use of. While following blogs and other publications, I find it very hard to keep up to date with Twitter. Even with my smartphone, its just so dang hard to stay up with. There are many sources out there that are addressing the continual benefits of utilizing Twitter in the classroom. The strengths of Twitter include real-time, rapid communication and feedback; ease of sharing links and resources; and the ease of making a channel more public than a particular classroom. There are particular challenges that these strengths can help address, such as increasing student engagement in a larger class or student group, providing timely feedback to an instructor, extending learning outside the classroom, encouraging sharing of information and resources among students. This information, pulled from academicimpressions.com, provides just a sample of benefits that can be seen in the educational setting. Perhaps one of the most interesting points this website discusses is that it extends learning outside of the classroom. No longer are discussions limited to that short, 45-minute period. Instead, students are encouraged to continue discussions and learning once they leave. Spotlight.macfound.org reports a study taken place at Lockhaven University found that those who used Twitter to continue class discussions and complete assignments were more engaged in their classwork than students who did not. In addition to showing more than twice the improvement in engagement than the control group, the students who used Twitter also achieved on average a .5 point increase in their overall GPA for the semester. There are promising studies that provide the benefits of Twitter and other social media sites in the classroom. Students continue to be preoccupied by their phones, computers, tablets, etc., so why not make them a part of the curriculum. If it holds their interest and learning is being witnessed, why not take advantage of this opportunity? I have never used Twitter, but it sounds like a good thing. Technology has improved our lives in many ways (also in some negative ways) but as long as people use technology in a smart and balanced way, it is so helpful and educational. I would love the opportunity to do Twitter, though I don't know how it would come up when I teach in a classroom. Hopefully it would be allowed in my school. The story about your wife is both sad and uplifting at the same time as so many people showed so much support. 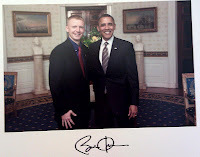 Meeting the president is awesome! Keep up the good work and I am glad our teacher, Laura Ewanic, let us know about your blog.